The different casting processes are based on the type of mould or the method used to fill the mould. Castings are made by pouring molten metal into a mold or die. When the metal cools it takes the shape of the mould or die. Ferrous alloys, Copper alloys, Aluminium alloys, Tin alloys, Magnesium alloys etc can all be cast. The green sand process is one in which moist bonded sand is packed round a wood or metal pattern to make a mould. The pattern is then removed and the mould is used to make a cavity . Molten metal is then poured into the cavity. When the metal solidifies and cools the mould is broken and the casting is removed. Almost any metal can be cast using this process to any size and the production process is relatively cheap. This process does not produce accurate parts and machining is almost always required following sand casting. The shape of items is the some extend affected by the process. The cast section should be maintained uniform. Long thin sections should be avoided. The dry sand process is similar to the green sand process except that core boxes are used in place of patterns. The sand is bonded with a setting resin, and the the core is then oven baked to remove the moisture. This process is generally used for smaller castings. The Carbon dioxide sand process is one in which the sand moulds are bonded with sodium silicate solutions and set by injecting carbon dioxide gas through the sand. This method produces strong accurate moulds and the consequent castings are relatively accurate. It is possible to eliminate machining by using this process. Using the core sand mould process the moulds are assembled from oven baked cores set with binders . This process involve coating the sand mould with a thermosetting plastic. The mould is then supported at the outside by sand or shot and the molten metal is poured. When the metal has solidified the mould is broken away from the finished casting. Shell mouldings have smooth surfaces, uniform grain structure, high accuracy, rapid production rates and minimal finishing requirements. This process is relatively expensive and limited to few metals. In this process the pattern is in made from foamed plastic e.g. polystyrene. When the molten metal is poured into the mould the plastic vaporises away. This type of casting does not require a draft and produces no flash on the finished casting. There are no difficulties with bosses undercuts and inserts. A well made mould can do 20,000 castings. The mould will require regular redressing after at least 2,000 castings. The castings produced by this method have a good surface finish, a good grain structure, low porosity and high dimensional accuracy. The initial mould is expensive but the unit costs of the castings are generally low for high production quantities. This process is limited to fairly simple shapes. This process is used in the quantity production of aluminium, zinc, lead, and magnesium alloys. The method can be used for tin and copper alloys. Die castings are made by forcing molten metal under pressure into accurately machined steel dies. The dies are generally water cooled. The dies are normally held in hydraulic presses which open when the metal castings cool down. The molten metal is forced into the dies at pressures of 10MPa to 175MPa. For this process the moulds are made of ceramic powder, binder, and gelling agent. The mould can also be made of ceramic facing reinforced with a sand backing. The method is limited to casting intricate parts requiring fine detail, close tolerances, and smooth finishes. The minimum wall thickness recommended is 0.7mm to 1.5mm with no limit on the maximum wall thickness. Parts which are intricate in shape with a high dimensional accuracy and excellent surface finish can be produced using the investment casting process. This process can be used for a wide range of metal alloys and can be used to produce finished components with not machining required. A pattern is made by injecting wax into a split mould. The mould is usually metallic but can be rubber, plastic, or plaster of paris As the pattern is usually small a number are frequently assembled on a wax feeder using a heated spatula allowing several parts to be cast from a single mould. The resulting pattern is dipped into a refractory slurry a number of times if a shell mould is required. Optionally if a solid mould is required the patter is placed, feeder down into a open ended can into which a slurry of refractory material or cement is poured..
To complete the mould the wax pattern is removed by melting it out in a furnace. The casting can be produced by pouring the molten metal in the mould or it can in injected in under pressure for a higher grade denser casting. This is method of casting a shape by pouring the molten into a rotating flask containing the mould. The moulds are made of sand, metal, or graphite (depending on the metal cast) and are rotated about their axial centres. Relatively large diameter and bulky items are made by this process. Typical products include pipe, gun barrels, hollow shafts, machinery drive rolls. Where the diameter to length ratio is large the rotational axis can be vertical. 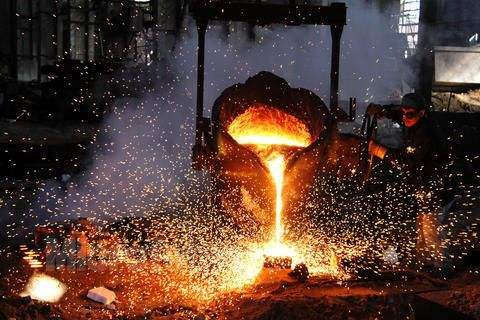 This method of casting is used to produce ingots on a continuous basis, the molten metal being continuously poured into one end of a vertical open-ended mould of the appropriate cross section. As the metal passes down the mould it cools and solidifies. The walls of the mould are water cooled and the metal as it emerges from the mould is sprayed with cooling water. Ingots are produced by cutting of the cast metal with a flying saw which moves down at the same speed as the solidified metal. A piston supports the metal and controls the speed that it moves down. Continuous cast ingots have superior mechanical properties compared to conventional sand cast products. This is due to its fine grained, dense structure. The surface finish is also improved and there are no sand inclusions.